110 days. Allium cepa. Open Pollinated. 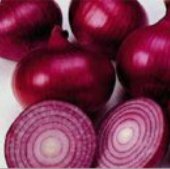 Plant produces excellent yields of sweet red onions. Perfect for salads and sandwiches. 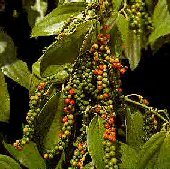 They are great additions to salsas, Cajun foods, and other zesty dishes. Stores well. Excellent choice for home gardens. A short day heirloom variety developed in 1962 by the Dessert Seed Company. United States Department of Agriculture, PI 662428. Disease Resistant: PR. 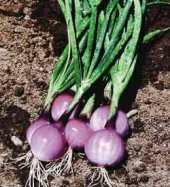 Onions seeds should be planted indoors 6 to 8 weeks before ground can be worked. You can also plant seeds directly in the garden. Spring planting should occur as soon as soil can be worked. Keep free from weeds. You need long sunny days to grow large onions. Shallots are very close to garlic and are very easy to grow. Plants can grow 8 to 12" tall. Keep seedlings and transplants consistently moist, but not waterlogged. Water well during dry and hot spells. You can harvest onion for their green stems (scallions) at anytime. Cut the green stems with garden scissors when tops are 4 - 8" tall. For bulb product, let the tops dry up themselves before digging them up. Spread bulbs on ground for 3 to 5 days to cure. Pink Rot is a devastating soil borne disease that affects the growth of onions and can occasionally affect corn, peppers, spinach, and soybeans. The disease started in North Carolina and the mid-Atlantic region and continues to spread to other areas. The disease affects the roots, where they become shriveled and deteriorate, and then may disintegrate. Symptoms of wilting of the leaves may occur and the leaves turn a pale green and start to die off. 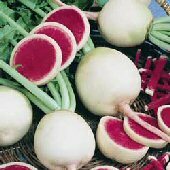 Onions infected with Pink Root often show a light pink color, then becoming a darker pink color, and progressing to a purple-brown color. The plant is rarely killed by the disease, but the bulbs never matures fully. The surviving plants are stunted and the bulb size is reduced and becomes soft and non-desirable. Cold weather, drought conditions, insect spreading the disease, nutrient deficiencies, and other diseases, can cause stress to the plant which can increase the severity of the disease. Plan on using a 6 year crop rotation and avoid planting onions in the same location, year after year as the disease can survive in the soil for a long time. The best option is to use disease resistant varieties and/or use a root fungicide for soil based diseases.